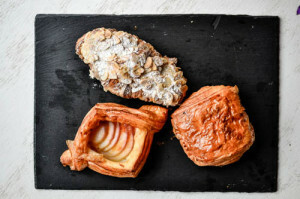 One of the many reasons that I love living here in Melbourne is that we are the hub of the food and art scene of Australia. We are fortuitous enough to be exposed to events that some only dream of. Events such as the annual Australian Open, the Formula One racing, as well as the numerous sporting events that this country holds dear. Not only that we have a multitude of musicals and theatre shows that come round. We even had the World’s 50 Best Restaurant ceremony converge upon humble Melbourne this year. Apart from these great sporting, dining and entertainment events, we are also often exposed to seasonal art exhibitions at the National Gallery of Victoria (NGV). We have seen past exhibitions with collections from Salvador Dali, Ai Wei Wei, Claude Monet, William Blake, Degas and a lot more featured. 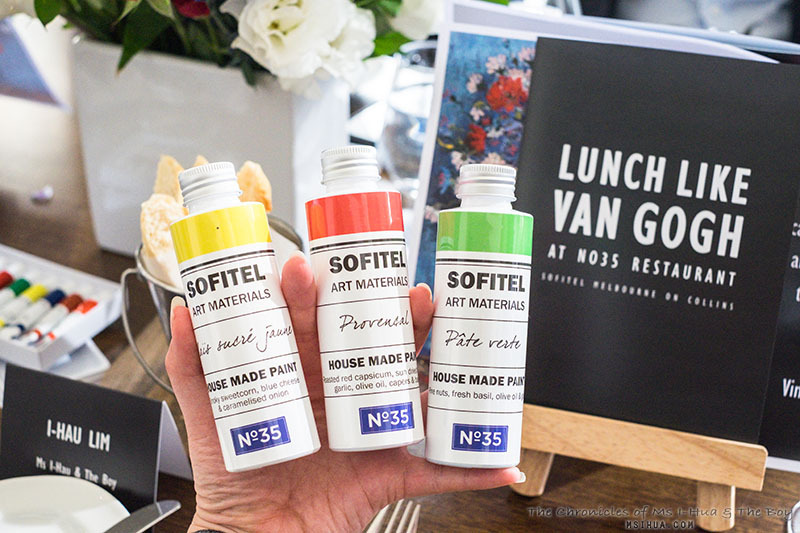 To celebrate the latest art exhibition curated especially for the NGV featuring the one and only Van Gogh, Sofitel Melbourne‘s No.35 Restaurant has collaborated with the NGV to put together a Lunch Like Van Gogh special. You have a choice of a 2 course (for $45 pp) or 3 course ($60 pp) meal to sample what Van Gogh would be eating in the 1800s, with a modern twist. 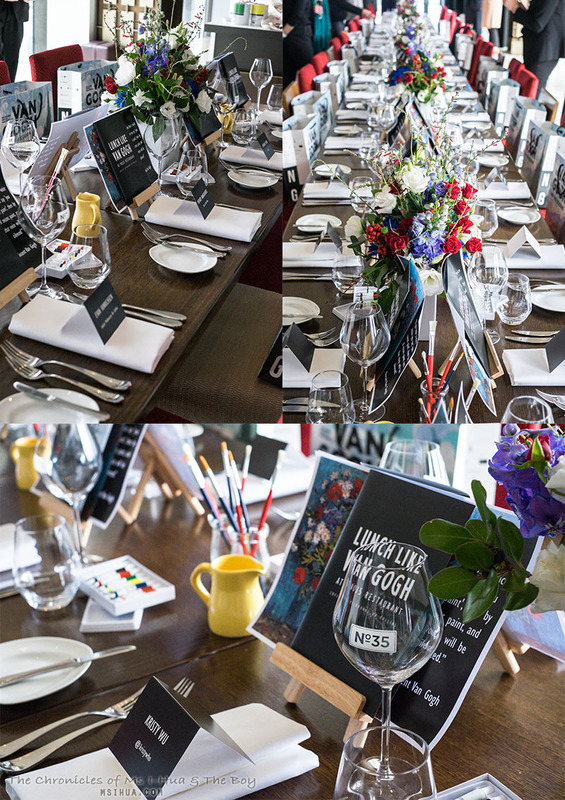 For the launch of the event, we were regaled by the hearty notes from the Victorian Opera, as we played with our food! 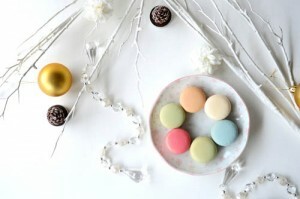 ‘House Made Paint’ of yellow, red and green were presented to us in paint bottles together with slices of baguettes. Upon further reflection, these turned out to be delicious patés of amuse bouches, Smoky sweetcorn, blue cheese and caramelised onions (yellow), Roasted red capsicum, sun dried tomatoes, garlic, olive oil, capers and basil (red), and Pine Nuts, fresh basil, olive oil and garlic (green)! pomme purée, sautéed mushrooms and red wine sauce. 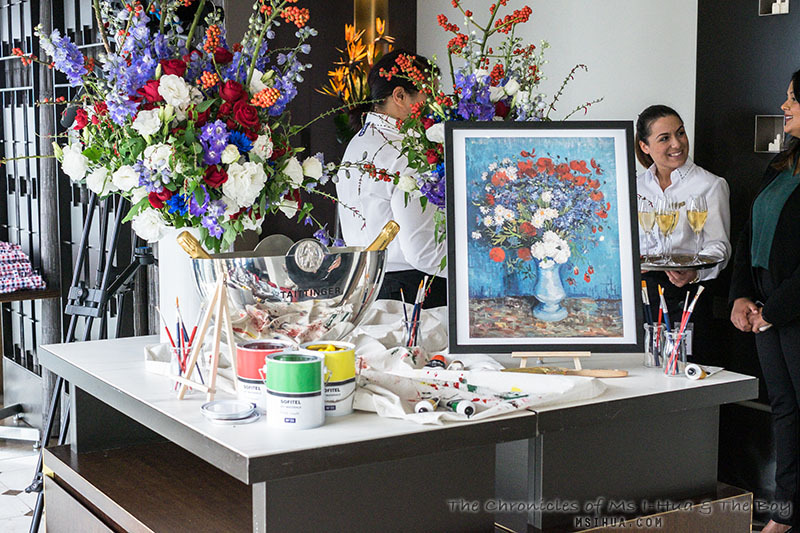 It was at this point where the guests were invited to start painting (with real painting) a copy of Van Gogh’s iconic 1887 Vase with Cornflowers and Poppies on a white plate. There were many delightful giggles and laughter as our inner artists were brought out to the forefront! Notably there were very impressive paintings made that day with the winner being D from Gastrology! Yay! For dessert, we had a delicious light ‘Pastel’ Crème Caramel with Cognac soaked raisins. So pretty too! If you are keen to embrace your inner post-impressionist artist and dine on the curated menu at No.35 Restaurant, the lunch is available from 12pm every Thursday and Friday from 11th of May until the 9th of July 2017. 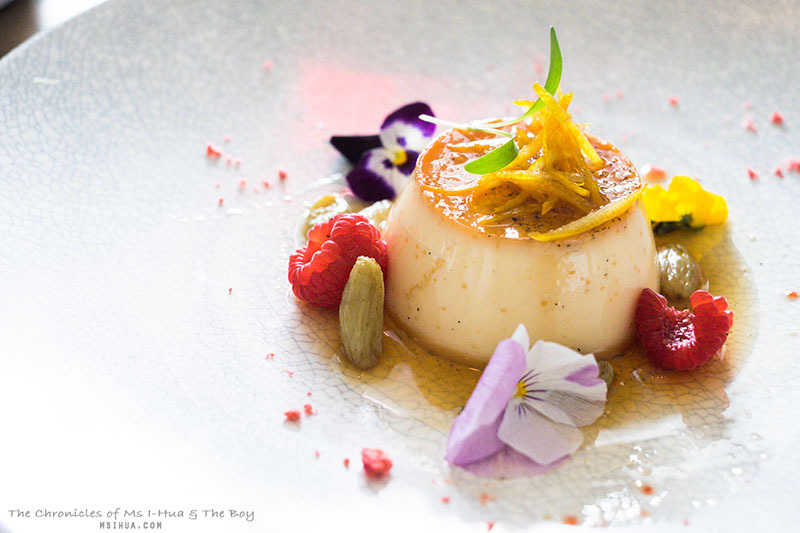 As an added bonus, Sofitel is offering visitors a special Cultural Package, which includes an overnight accommodation with breakfast for 2 at No.35 Restaurant, plus two tickets to NGV’s Van Gogh & The Seasons exhibition. Prices start from $315* per room per night (*T&Cs apply, limited time). I really like this idea! 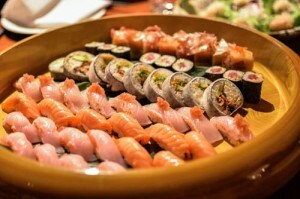 Sounds like it would be a great time with impressive works of art and delicious food.